In early 2018, the AMP Boston Media strategy, buying and planning team was tasked with planning and executing Spindrift’s first national, multimillion dollar campaign with the goal of increasing overall recognition of the brand. In a sea of clear “natural flavors”, Spindrift is the first and only sparkling water in America to be made with real squeezed fruit. I mean, when was the last time you saw a clear raspberry?! On top of that, the fruit used in Spindrift is sourced from local farms and made in small batches so it’s a drink that you can truly feel good about. Flavors include Grapefruit, Lemon, Orange Mango, Strawberry, Blackberry, Raspberry Lime, Cucumber as well as two newer flavors, Cranberry Raspberry and Half & Half. Yum! 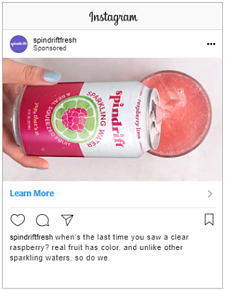 The goal of the campaign was to target both male and female sparkling water drinkers and educate them on Spindrift’s real ingredient difference. The media strategy approach was rooted in strong preliminary audience research, determining the best mix of digital and traditional channels to reach this target. The media team did a deep dive into not only the audience’s media habits but also their attitudes toward things like grocery shopping, health and wellness, and overall lifestyle choices. Giving the Spindrift consumer a personality helped us envision where they were on a day to day basis and how they consume media, resulting in a strong, strategically rooted media plan designed to drive business results. ith search, social and programmatic display in May and then expanded to Print, OOH and Digital Content partnerships in June and July. The campaign will run for the remainder of 2018, with the majority of the spend condensed in the summer months. OOH units are focused on five key markets – Boston, Los Angeles, New York City, San Francisco and Chicago. The creative, led by Mistress Agency out of LA, highlights the simplicity of the ingredients in Spindrift and the tag line “yup, that’s it”. Recently, Kristen Bell was tapped to promote Spindrift through a series of videos that are currently being promoted through programmatic, YouTube, paid social and our direct content partnerships. When Kristen is a superfan of the brand, you know it must be good! 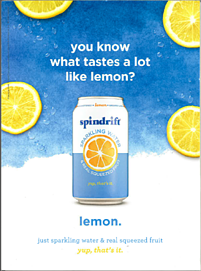 Happy reading and grab yourself a delicious Spindrift – real squeezed fruit and sparkling water, yup that’s it! The number of marketing technology tools is rising at a staggering rate, having nearly doubled YOY in 2016. On average, 51% of organizations use 21 or more digital marketing solutions. While having the ability to access all this new information provides unprecedented insight, it frequently results in an overload of data siloed in disparate systems. Marketers are buried under a landslide of fragmented campaign metrics, products, customers, purchases, and more. And there’s seemingly no end in sight; Gartner reports that 50-65% of marketing executives plan to spend more on marketing technology in the coming year. To make meaningful use of all this data, metrics need to be reviewed cohesively. Without a full holistic view, it’s impossible to get a complete understanding of the real story. Only analyze existing customer behavior and you may miss out on opportunities to attract new audiences. Only review site traffic from media placements, and you lack an understanding of why your customers are loyal to your brand, or how to create more of them. The problem is that most marketing teams don’t operate with systems that talk to each other. They end up trying to manually analyze disparate data points to uncover insights, a practice that is neither scalable nor responsive in real-time. This data fragmentation is costing marketers real dollars as they lose the ability to effectively optimize campaigns and fold learnings into future plans. The solution begins with creating a connected data ecosystem. The concept is simple—collect all data points into a centralized system able to analyze them en masse and surface actionable insights in real-time. 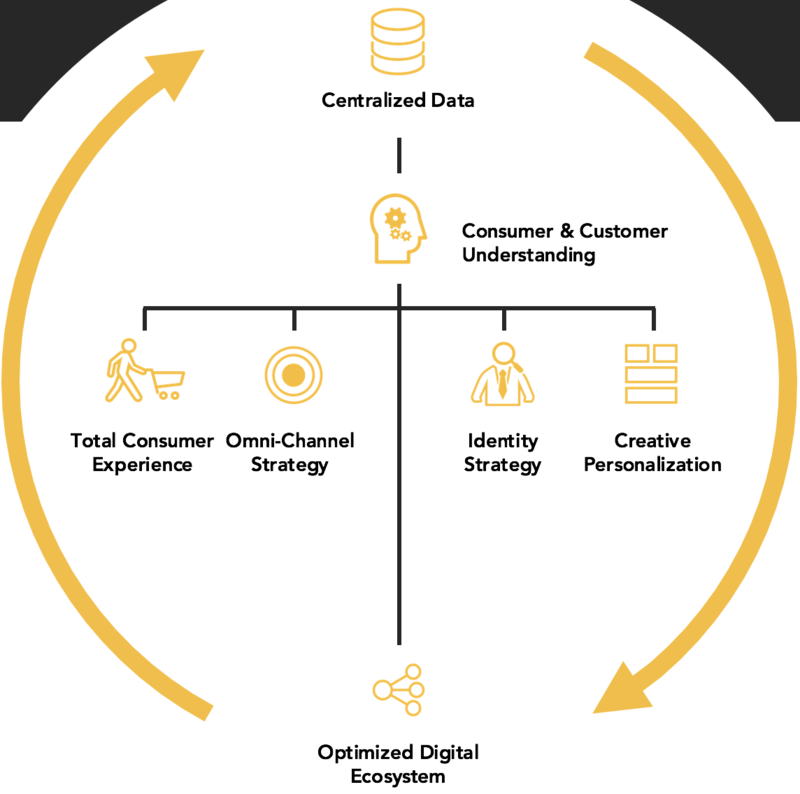 Using those insights, marketers can then start to roll out personalized content, translate strategies across all channels, and efficiently improve customers’ experiences. While the initial creation of the connected data ecosystem can be time-consuming, it pays off. One example: Annuitas Group reports that businesses that use marketing automation to nurture prospects report a 451% increase in qualified leads. Discovery: we assess all the various systems that are collecting data around your organization. We also identify areas where the data returned may be less than perfect in quality–a very common occurrence. During this period we also outline the shared objectives and definitions of success across all the stakeholders. Solution design: using our learnings from the Discovery period, we design a customized solution that aligns to your business objectives. We build a roadmap using multiple analytic approaches across our four service categories: Performance analytics, marketing sciences, research, and business intelligence. Analyze: This is where the magic happens. Now that we’ve designed your ideal system, we begin to collect the data and review the outputs using our team of data analysts, statisticians, and social scientists to uncover those insights that will truly give your business the competitive edge. Insights: This is when our team works with marketers and other members of your organization to communicate our findings and share recommended actions to meet your KPIs. Once the initial foundation is built, this process can be repeated multiple times over the course of the year, ensuring your teams are always up to date on the latest findings and fully able to use fresh data to inform future plans. The creation of a connected data ecosystem takes some effort but pays off almost immediately by making teams run more efficiently with a full understanding of the current state of their business and what levers they have to achieve their goals.